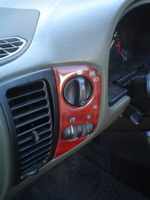 Bekleding voor het verfraaien van uw dashboard. Complete zelfklevende sets van hoogwaardige kwaliteit. Read this instruction carefully before the installation! 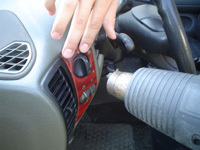 Do not stick the parts if the temperature inside the car is below 18 °C. 1. Remove all the grease from the surfaces on which the finish is to be stuck with a 96% ethyl alcohol (spirit). Repeat the cleaning if necessary. 2. 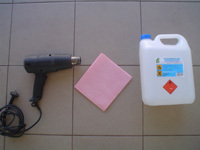 Heat the surfaces of the parts slightly to a temperature of about 35-50 °C with the use of a hair-drier (do not remove the transport paper). 3. Remove the transport paper from the part which is to be stuck, then fit it to an appropriate place. 4. When the part fits the place, press the part against the surface and hold pressed for a moment. Warning: On bigger surfaces, the parts are to be stuck like wallpaper, that is make sure that no air gets under the finish. 5. 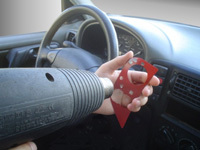 When stuck, the glued parts should be heated once again (temperature 35-40 °C) being pressed at the same time. Warning! When sticking, do not touch the surfaces which are covered with glue. Use only a clean cotton cloth that does not shed snippets for removing grease. 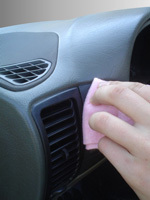 Before the installation check that the upholstery has not faded or been damaged under the influence of the cleaning agent (alcohol) and the carrier glue (it applies especially to leather car upholstery). We advise you to have a technical inspection of the vehicle carried out after the installation of the parts. The parts may not be stuck onto the airbags under any circumstances! The finish will be installed properly only if you adhere to the above instruction.